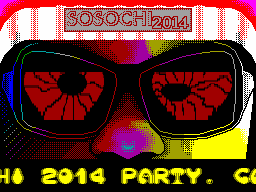 "Welcome to Sochi 2014 Party. Watch the snowboarders competition, live." "BREAKING NEWS! On the Sochi Olympics, the Spectrum fans from Jamaica and Simbabwe thought that ATM Turbo 2 is [not] a Spectrum!" Kinda wish Jamaica had some Speccy fans. This fun demo deserves lolympics gold medal! Funny one and entertaining music!! Btw initial download link was this one. While browsing, i've listened to Mister Beep Chromospheric Flares. Don't found it on Pouet imo it worth being added, some tunes are really good. They should be added as standalone demo. I liked the music very much, the jokes (some in Russian) are funny, and the graphics are nice too. I wish it was a minute longer, but there you go. should have been a thumb up! BackSpace, will do - but only when wormsbiysk compiles the post-party version of POINT3D. Love the text change effect in the greetz part. I refuse to believe that this demo/intro/fastdemo/whatever has hit the top of the month. I don't support the internal ZX platform wars (everybody knows I make software for Spectrum48 but I support the new models :) ), however the demo is good-looking and has nice music. page created in 0.016890 seconds with 15 queries.